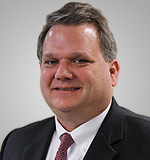 John J. Greive serves as Vice President & General Counsel of Advanced Solutions, Inc. Prior to joining Advanced Solutions, John worked for over 17 years as Vice President of Regulatory Affairs and General Counsel for Lightyear Network Solutions, Inc. and its predecessor companies. In this role, he was responsible for all legal, regulatory and human resource matters. At Lightyear, John guided the company as it emerged from bankruptcy in 2004 and completed a reverse merger with a public company in 2010. John managed all litigation, contract negotiations, SEC filings and the eventual sale of the company and its dissolution. Prior to this, John maintained a general law practice as a partner with Chandler, Saksefski and Greive. John received his B.S. in Mathematics from Bellarmine University and his Juris Doctorate from the University of Louisville. John and his wife live in Louisville, KY with their three children.